I came under the impression that this would be a restaurant with low prices and satisfying portions after reading a few online reviews. The newspaper clipping posted near the entrance of the restaurant further reaffirmed my beliefs. 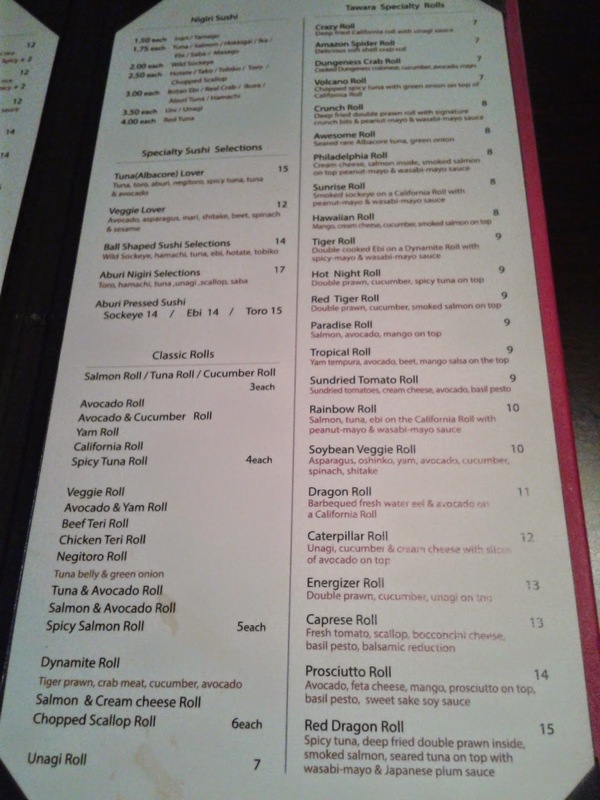 However, when I opened the menu, I was quite surprised to see rather elevated prices for most of the menu items. Was I supposed to expect Anton's Pasta-sized dishes then? The Korean-run restaurant was renovated to resemble an upscale smokehouse setting. The restaurant is quite large but most of the seats were unfilled during my visit. After mulling over the menu for almost half an hour, I decided to test the waters by ordering the Tiger Prawn & Beef Yaki Udon. 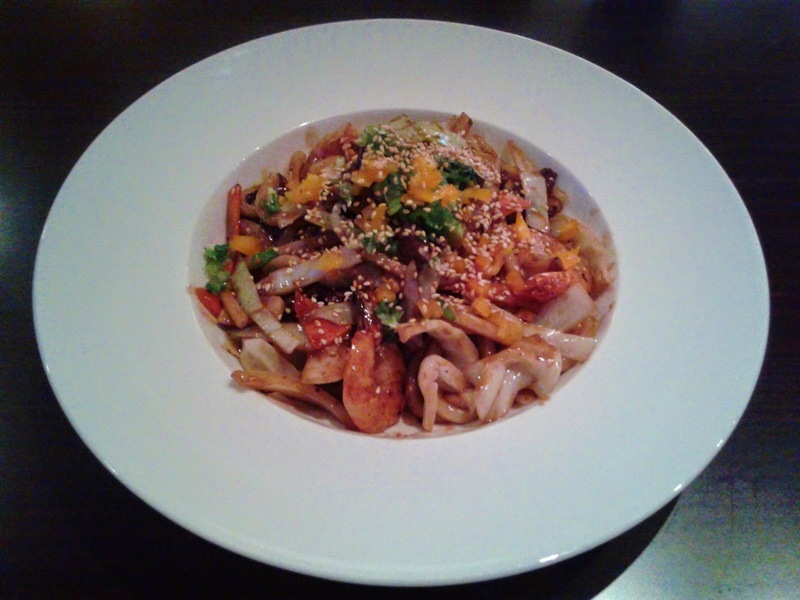 The Tiger Prawn & Beef Yaki Udon was generally well-prepared, but was certainly not Anton's Pasta-sized. The pan-fried thick noodles were not too thick and on the softer side. The beef, along with the sesame seeds, reminded me of a tasty hamburger patty, though it would have been nice if the beef was more tender. I managed to find 3 tiger prawns in the mix, which had a slightly crunchy snap to them. The teriyaki sauce was applied in just the right amount, but I found it slightly overpowering at times. 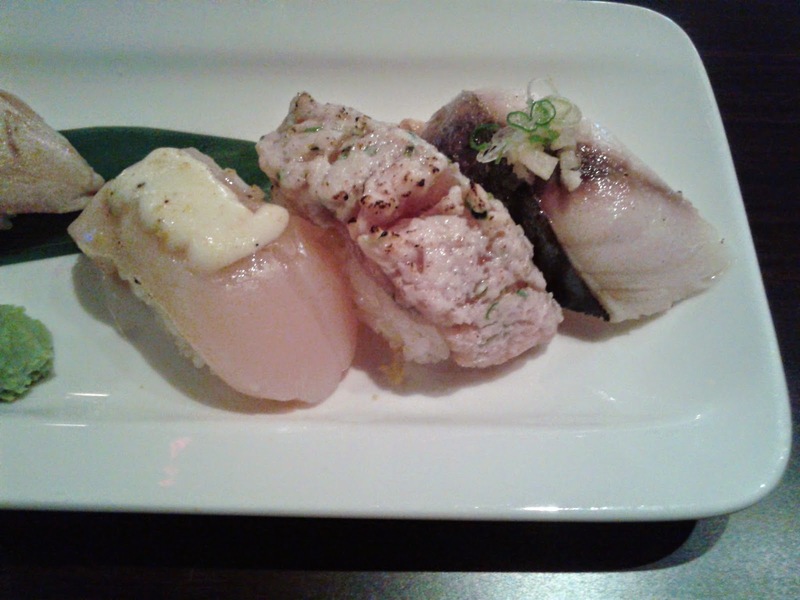 I decided to continue ordering and tried the Aburi Nigiri Selections ($17). 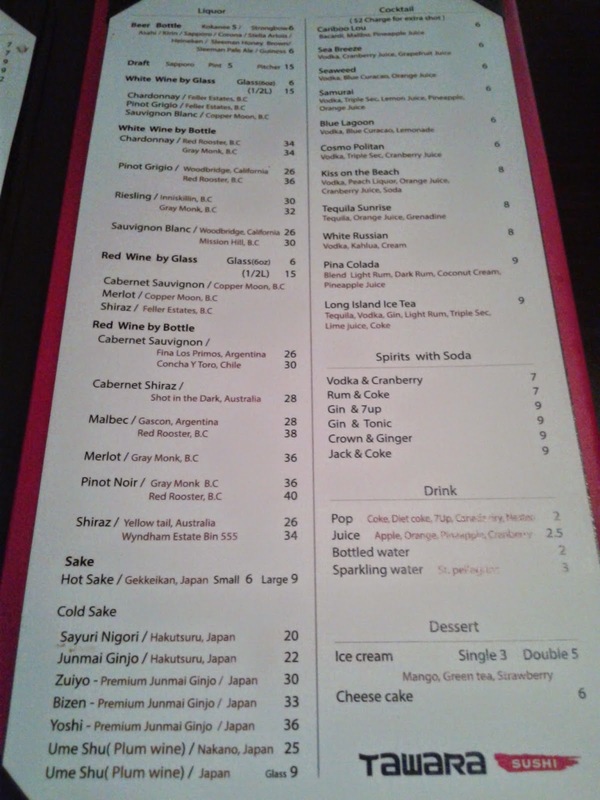 I was a bit disappointed to see that they left out the two most expensive kinds of seafood (hamachi and unagi), as the unagi was what drew me to the dish in the first place. At least they gave me one more piece than what was promised on the menu to make up for it. The Aburi Sockeye Salmon Nigiri lacked a smooth texture and flavour and I felt that the dill cream pairing wasn't the optimal choice. I wasn't a big fan of the Aburi Tuna Nigiri either, because the vinaigrette (it seemed like a spiced apple vinaigrette) was quite discordant with the flavour of the tuna. Eating the Aburi Ebi Nigiri turned into a tug-o-war between my chopsticks and my teeth because the ebi was over-boiled. The Aburi Toro Nigiri was when I first noticed the nicely seasoned rice because for the first time, the fish topping actually tasted right. Moving onto the right side of the dish, the Aburi Scallop Nigiri was nice and soft with a pleasant, sweet flavour and here, the dill cream sauce worked. The Aburi Negitoro Nigiri should have been called the Aburi Dace Fish Paste Nigiri because that's what it looked and tasted like. I found the Aburi Saba Nigiri a bit too tough and salty while lacking a seared taste. It was similar to an average unseared Saba Nigiri from an average Japanese restaurant. 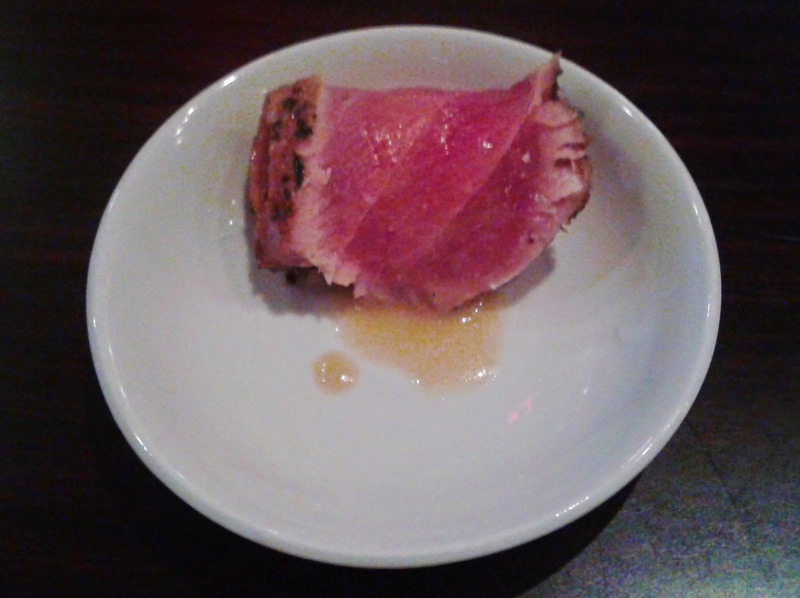 The next item to arrive was the Red Tuna Steak Tataki with Miso Sauce, which was a gift on the house! It was easily my favourite item of the night, as it was refreshing and delicious. Some parts of the tuna could be softer, but the miso sauce, which was accompanied by a lemon-flavoured sauce, went very well with the red tuna steak. The Rainbow Roll consisted of salmon (Atlantic and sockeye), tuna and ebi on a California roll with peanut-mayo and wasabi-mayo sauce. Both kinds of salmon had a nice, smooth texture and each tasted quite fresh. 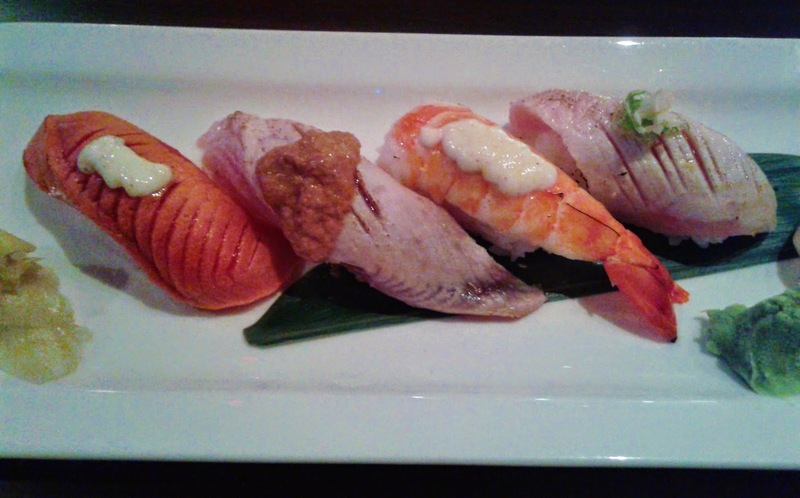 The tuna was also a delight as it was soft with just the right balance of flavours, while the ebi was still stiff. I liked the small dabs of peanut-mayo sauce on top, which made the roll quite unique and memorable. However, the California roll base was quite cold, and the dryness of the crab meat made the roll taste pre-made. I was very satisfied with the service, which was patient and excellent overall. The servers exhibited great attitudes and my tea was always refilled in a timely manner. Every staff member in sight gave a warm goodbye as I exited the restaurant. The ambience inside the restaurant was also something to be enjoyed. 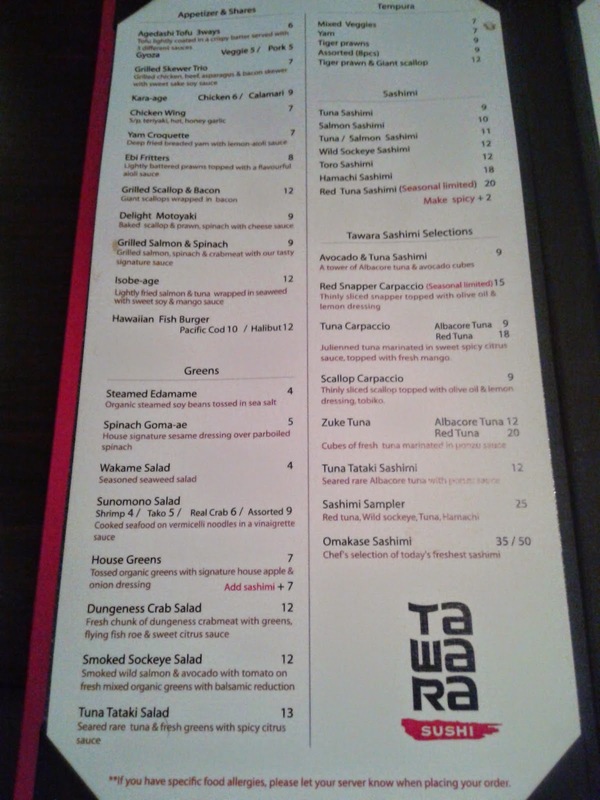 With regard to the food, I appreciate their willingness to try out different ingredients to create unique and interesting dishes. 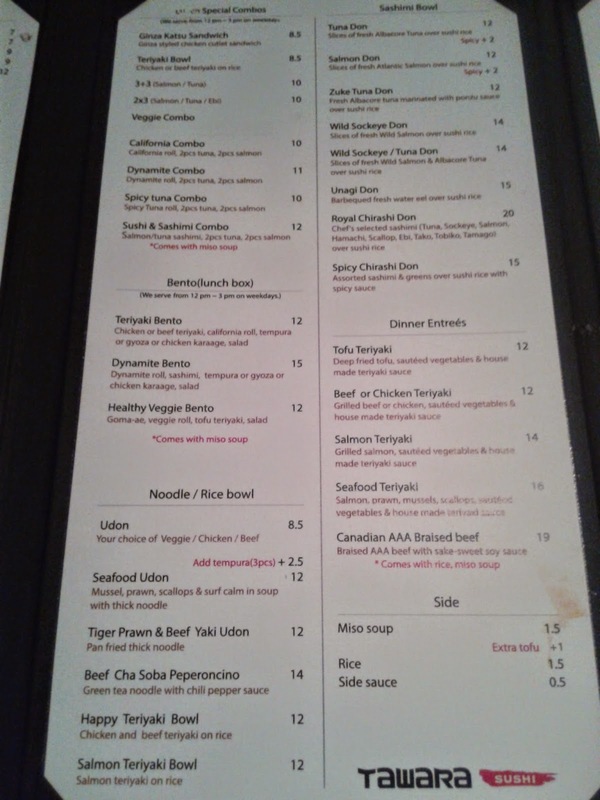 However, considering the quality of the food (based on the dishes I tried), the prices could hardly be justified. I felt entitled to much more consistency and quality for the price I paid. 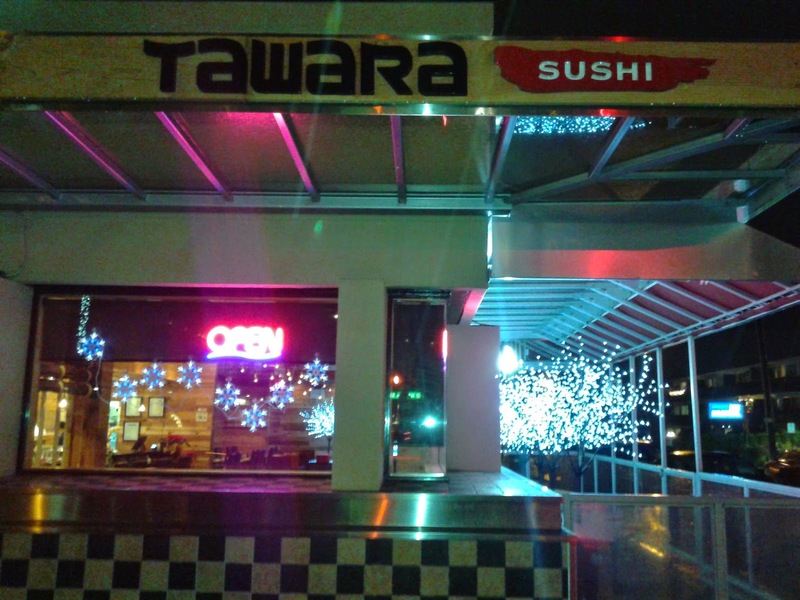 Most of the disappointment arose from the Aburi Nigiri Selections, but the other dishes were not stellar enough to save my first experience with Tawara Sushi.